When the weather is nice, your son will not come inside and you just want to be out there too drinking a cold one.. this is my dinner! Every groccery trip I buy a few extra veggies just because I know we will eat them before they go bad. 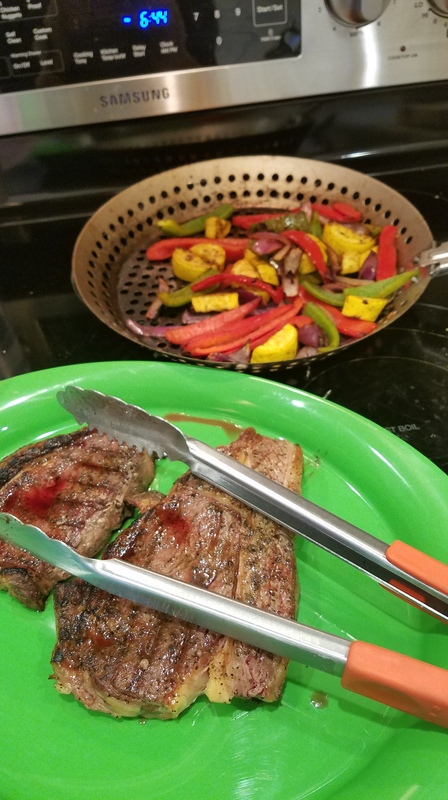 Tonight was steak on the grill with a plate full of veggies. I will admit.. I am super super spoiled in the meat department. My dad has cattle and very generously shares and my husband is a hunter so we eat a lot of venison as well. We live in Oklahoma.. we don’t buy much fish. Very rarely will I cook with seafood. If we have fresh seafood it costs way too much or its farm raised and I just cant..
All cut into about 1/2″ thick strips. I did not want to cut too small because they were on the hot charcoal grill and have them sizzled down to nothing before the steak even started charring. Pour on a teaspoon of oil (Olive, Coconut or Avocado) then season. Toss then throw on the grill pan. 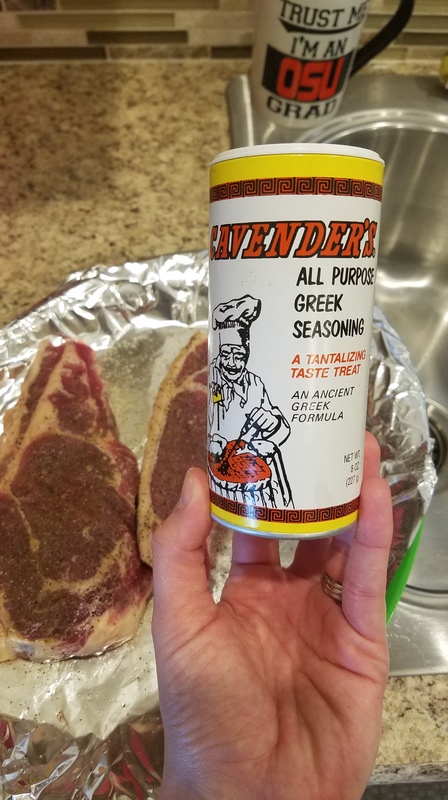 I tenderized these with a meat tenderizer (the spiky one) then I seasoned my steak with Cavender’s all purpose greek seasoning. It is probably not the best for you but it is delicious. My grandaddy, daddy and husband use it. I love it and it makes a heck of a steak. Cook the veggies and steak to your liking. Chris likes his steak a little blue, I like mine pretty pink. Easy! I didn’t have to cook – what man doesnt like to grill? and I got to spend time with my two favorite people on beautiful night outside.